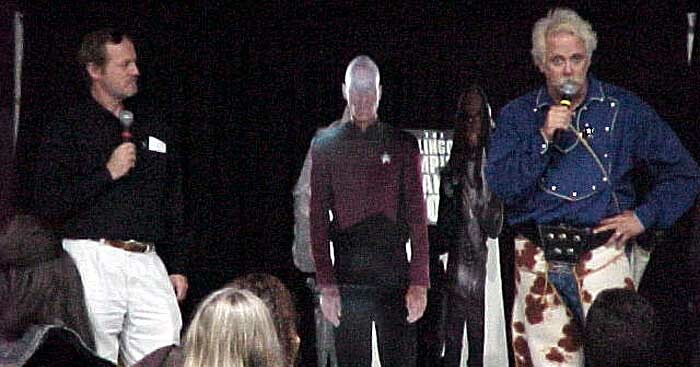 Robert O'Reilly (Gowron) and J. G. Hertzler (Martok) on stage at Trek Expo 2000 in Tulsa, Oklahoma. One of my admission tickets. 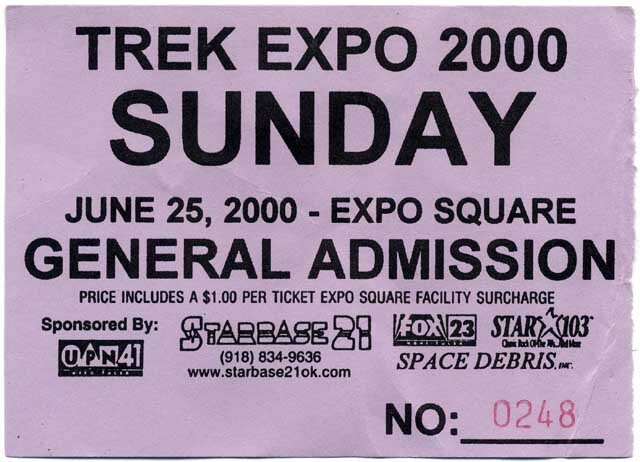 I had always wanted to go to a Sci-Fi convention, and this was my first time. I had a blast! So much to see, so much to do, so many people to meet. Where else can a geeky guy go and feel "normal"? About six months previous, I had joined the Klingon Imperial Guard, a Klingon club which is part of the United Federated Planets. When I was told that a Sci-Fi convention was held every year in Tulsa, Oklahoma, I could hardly wait to go. The group I joined was the IKV betle'H (Imperial Klingon Vessel betle'H), a ship (chapter) located in Lawton, Oklahoma. 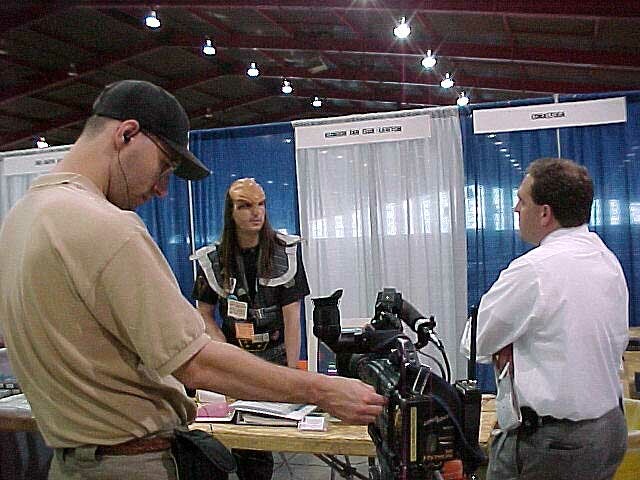 As I soon found out, the Klingon Imperial Guard does not simply attend the convention, we volunteer to work security as well, but only the simple stuff such as ticketing, autograph booths, celebrity "green rooms", and keeping an eye out for shoplifters. Me, feeling like a goober. News interview with IKV betle'H crew member, Darold Kowalke. 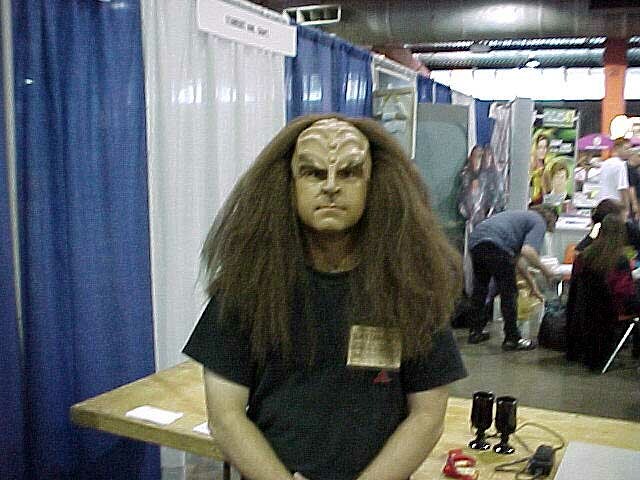 What's the point in joining a Klingon group if you don't dress up? A few months before the convention I ordered 2 headpieces, but they weren't ready until the night before the convention. Without the rest of the costume, my Klingon comrades talked me into wearing the headpiece alone, with only plain make-up base. I felt stupid. The media tends to drift toward Klingons whenever we're present, and Trek Expo 2000 was no different. Pictured here is a local Tulsa news crew at the IKV betle'H booth interviewing Darold Kowalke, crew member of the IKV betle'H. Being my first convention, I was pretty busy just trying to figure out what was going on. As a result, I didn't get photos or autographs from all the celebrities. Those pictured here, in photo sequence, are: Erin Grey (Buck Rogers), Bobby Clark (ST:TOS as the Gorn and other characters), Robert O'Reilly (Gowron on ST:TNG and ST:DS9), J.G.Hertzler (Martok on ST:DS9), Chase Masterson (Leeta on ST:DS9), Max Grodenchik (Rom on ST:DS9), and Tim Russ (Tuvok on ST:Voyager).